« Galileo’s Pendulum Has a New Look! Fomalhaut with its ring of dust and a possible, but now heavily disputed, planet candidate. Fomalhaut is a bright star relatively near to our Solar System. It’s about 25 light-years away, so it’s not right next door, but both close and luminous enough that it can be seen without a telescope. It’s an A class star, so it’s significantly hotter than the Sun; but it’s also a lot younger, possibly only a few hundred million years old, compared to our Sun’s 5 billion year middle age. Fomalhaut is surrounded by a disc of dust and gas, consistent with a relatively young star; according to formation models, planets form out of such discs. In 2008, astronomers analyzing Hubble Space Telescope images found several containing an object apparently in the disc that moved significantly over time — a distinctly plausible planet candidate. Called Fomalhaut b, the object was estimated to be about 3 times Jupiter’s mass, with an orbit of about 115 times farther than Earth is from the Sun. Readers with some astronomy knowledge will probably already see where this is going: that’s a long way out for a planet that size! It’s actually closer to the edge of the dust disc than it is to the host star. However, other exoplanet systems have challenged our planet formation models before, so maybe Fomalhaut is no different in that respect. Also, its large distance from the host star actually made it easier to spot, since the closer in a planet is, the more the star’s light will overwhelm it. 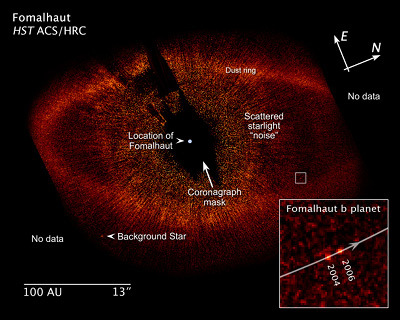 Fomalhaut b was warmly acknowledged by many to be the first directly-imaged exoplanet, a bit deal, since the vast majority of exoplanets can only be detected indirectly. Another larger problem with Fomalhaut b is that it’s too hot: planets do start off very hot when they form, then cool over time. (This isn’t just predicted by theory: geological evidence on Earth, Mercury, and other planets backs that assertion up.) Fomalhaut b, being that far out, simply shouldn’t be that warm; worse, follow-up infrared observations failed to find it. Ultimately, the very possibility that Fomalhaut b is a planet must be questioned. It might be a star behind the ring of dust, it might be a non-planet object in orbit, or it might be something else entirely. I really almost hate to contemplate that idea, since I use Fomalhaut b in my astronomy lectures a lot, and also used it as an example in the letter I wrote to a young child who asked me about my interest in space. However, sentimentality makes for poor science. Fomalhaut b may yet prove to be a planet, though it isn’t looking good right now. Either way, what we want to think about it isn’t particularly relevant. Our technology gets better, so we will directly image more exoplanets, perhaps even one orbiting Fomalhaut; if we must draw a lesson from the Planet That Wasn’t, it should be one of caution. As with the faster-than-light neutrino story, evidence and back-up observations will settle the issue. Sic transit gloria Fomalhaut.